Police on Monday foiled a march by YSR Congress Party to the parliament to demand the central government accord special status to Andhra Pradesh.Police stopped YSR Congress chief Y. S. Jaganmohan Reddy and his supporters as they tried to march towards parliament after a day-long protest at Jantar Mantar. There was a scuffle between policemen and the protestors.The main opposition party in Andhra Pradesh claimed that few activists were injured due to what it calls "over action" by police.Jaganmohan Reddy and other leaders including MPs and state legislators later staged a sit-in at Parliament Street police station to lodge their protest over the use of force by police. They were forcibly lifted from there as the protest was leading to a traffic jam. They were later released.Jagan, as the young leader is popularly known, earlier addressed the gathering at Jantar Mantar. Communist Party of India-Marxist general secretary Sitaram Yechuri also visited the protest venue in support of the demand for special status. 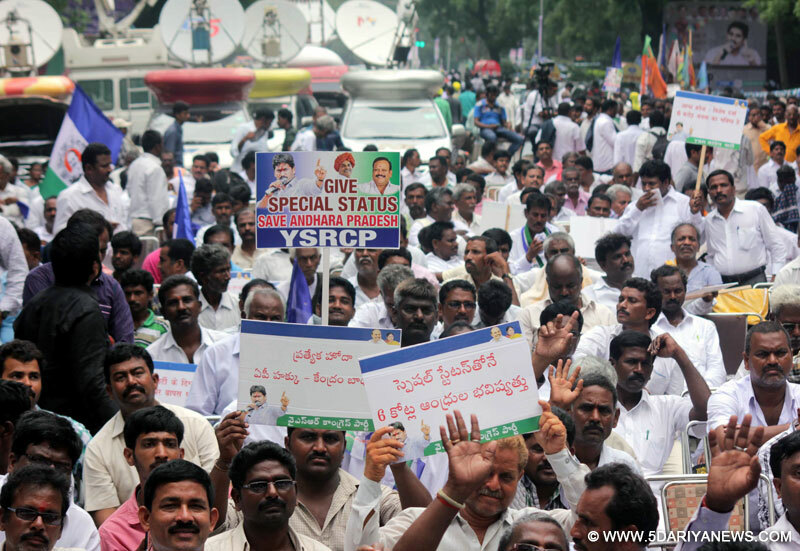 YSR Congress called for shutdown in Andhra Pradesh on August 28 to protest the delay in granting the status to the state.Jagan wondered why the special status can't be given to Andhra Pradesh when northeastern states continued to enjoy the same.The leader of opposition in Andhra assembly alleged that the central government is going back on its commitment to grant special status to Andhra to undo injustice done to the state during bifurcation.He targeted the ruling Telugu Desam Party for failing to get justice for the state despite being a partner in the ruling coalition at the centre and also hit hard at Bharatiya Janata Party for going back on its promise made in its election manifesto.Jagan also ridiculed the Congress' assurance that it will fight for special status, noting that it was responsible for creating the problem by dividing the state.